Most suitable for supply air in side-wall locations. With aerofoil shape louvers suitable in both horizontal and vertical directions, minor air motion problems can be corrected by adjusting the vanes. An opposed blade damper installed behind the grille is used for adjusting air volumes during air balancing. Choice of horizontal louvers in front and vertical at the back or vice versa is available. 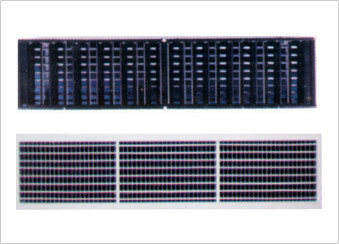 Model AB-DG-HV-RA horizontal louvers in the front and vertical in the back. Model AB-DG-VH-RA vertical louvers at the front and vertical in the back. Model AB-DG-HV-SA same as DHV but with VCD. Model AB-DG-VH-SA same as DVH but with VCD.